We were pleased to hear about the first ever Youth Bike Summit that was recently held in New York City. A featured speaker was NYC DOT Commissioner Janette Sadik-Khan, who has been transforming the streets of New York City and making them much more bicycle-friendly. More than 200 participants from 14 states and two countries came to New York this past weekend to swap ideas, learn bicycle advocacy best practices and build nationwide momentum in the country’s first-ever Youth Bike Summit, sponsored by Recycle-A-Bicycle. The youth spent three days learning everything from map-making techniques to political organizing strategies, participating in roller races and developing an action plan to advance biking in NYC and places beyond. To kick things off, DOT Commissioner Janette Sadik-Khan acknowledged the event’s female leaders by evoking Susan B. Anthony’s 1896 quote, "I think the bicycle has done more to emancipate women than anything else in the world." She then introduced Kimberly White, an 18 year old intern at Recycle-A-Bicycle as the Summit’s keynote speaker. While we do much of our riding on the road, but we also use the W&OD Trail to get to Vienna and points east and to Herndon and points west. It's been discouraging that the Trail still remains snow-covered several days after the last snowfall. Most roads are clear of snow, although we did notice that some roads, such as Soapstone Dr in Reston where the outside travel lanes were not completely clear of snow, have undergone a road diet and seem to be functioning fine. Maybe VDOT should experiment with road diets where feasible by not plowing outside lanes and intentionally creating narrower roads to see how traffic flows. The same is true of curb radii; intersections where snow is still on the edges (including blocking the sidewalks and trails) now have much narrower turning radii and they're working fine. Anyway, we just learned that the Northern Virginia Regional Park Authority has ordered a John Deere snow blower that attaches to one of their tractors. They hope to have the blower by mid-February. While they don't have a formal policy, it's expected that once the trail becomes snow-covered, NVRPA will begin to clear the Trail, including at intersections, where snow plowed from the street has piled up. They will allow a few days after the snowfall to provide skiers or snowshoe users time to use the trail. Gen Y housing preferences are the subject of at least two panels at this week's [National Association of Home Builders] convention. A key finding: They want to walk everywhere. Surveys show that 13% carpool to work, while 7% walk, said Melina Duggal, a principal with Orlando-based real estate adviser RCLCO. A whopping 88% want to be in an urban setting, but since cities themselves can be so expensive, places with shopping, dining and transit such as Bethesda and Arlington in the Washington suburbs will do just fine. Earlier we mentioned a study that estimated how much time commuters spend stuck in traffic. The study, based on traditional transportation modeling, does not take into account the impact of sprawl on commuting times. If we build more roads, we'll have more sprawl and guess what, we'll spend more time stuck in traffic. According to the Greater Greater Washington article Anti-livability bill passes Virginia House committee, "HB1998 would make it state law to base transportation decisions on traditional traffic models, which consider only the fast movement of cars and nothing about how closely people live to their jobs, the relative value of transit versus roads, safe movement of pedestrians and cyclists, or any other factors." The road lobby, supported by real estate and construction industries, loves the bill and is lobbying hard to get it passed.We think it's a bad bill and have written to our House Delegate asking him to oppose the bill. Contact your legislator and ask them to oppose this bill. See more about these bills at GGW. The new Tysons, in addition to very dense evenly mixed-use development near the three Metro stations, will feature an urban circulator, which could take the form of a streetcar or a rapid bus line. An expanded network of on-road bike lanes and off-road bicycle & pedestrian paths, as well as bike parking minimums, will help increase non-auto modes' share of daily commuters from just three percent today to 36 percent in 2030. Tysons Corner is poised to become North America's only example of a former sprawling edge city becoming a fully-fledged downtown in its own right. Making it successful — a task to which developers, nearby residents and government leaders are committed — will be a key step on the way to making our fast-growing region more livable and sustainable. Prior to the arrival of the new Gallery cars, VRE only permitted collapsible bicycles on board the trains. Once the new Gallery cars were in operation, the policy was changed to permit bicyclists to bring full size bicycles on the last three trains on both lines in the mornings and the evenings. With ridership increasing and the number of standees growing, there is little room for bicyclists to safely store their bicycles and still provide seating for all riders. VRE is proposing to limit bicycles once again to collapsible bicycles only. Public hearings on the proposal begin on February 1 in Fredericksburg. The Fairfax County hearing is on February 27 at Burke Centre Conservancy. If you can't attend the hearing to speak out in favor of bikes on VRE, visit the WABA Action Center to submit comments. With the expected several inches of snow tonight this will probably not affect a lot of cyclists, but the W&OD Trail will be closed tomorrow, Thursday Jan. 27 from 5:30pm to 5am between Vienna and Hunter Mill Rd. Since the Trail is not plowed, there won't be many cyclists using it tomorrow anyway. Fairfax Police are overseeing another deer killing operation in the area adjacent to the Trail. See our earlier announcement about the closing. According to the Friends of the W&OD Trail, the Trail will not close until 7:30pm that night, but the signs posted there now indicate 5:30 as the closing time. HB1683 and 2194, the three foot bills sponsored by Delegates Tuscano and Ebbin were killed this morning in a close 4 to 3 vote in House Subcommittee #2. Voting in favor were Delegates Jeion A. Ward, Betsy B. Carr, and William H. Cleaveland,. Voting against the bills were Delegates Charles W. Carrico, (Chair), John A. Cox,, G. Glenn Oder, T. Scott Garrett. Senator McDougle’s bill in the Senate is still alive. Parents of children at Terra Centre Elementary School want their kids to be able to safely walk and bike to school. The school is adjacent to Burke Centre Parkway, which is a wide, divided four lane road with a 40mph speed limit that is frequently exceeded. The parents have a simple request, that motorists be warned that there is a school zone ahead. We, as parents of school-aged children and/or those who work and live in Burke Centre, support passage of House Bill 1879 (Senate Bill 768), which would allow Burke Centre to designate the portion of Burke Centre Parkway (BCP) in front of Terra Centre Elementary (TCE) School as a school zone. Please sign the petition to support this effort. After signing you'll be asked to donate to the petition site. This is not required for the petition to be completed. There will be a meeting on traffic-calming of Burke Centre Parkway on February 7 hosted by Supervisor Cook. The meeting is from 7-9pm at Terra Centre Elementary School, Address: 6000 Burke Centre Parkway, Burke, VA 22015. Cyclists are encouraged to attend to speak out for a safer Burke Centre Parkway. See the Burke Walks Facebook page for more info. Thank you for this opportunity to speak to you tonight. I'm here to ask for your support for encouraging more kids to walk and bike to school through the Safe Routes to School program. Back in 1969, 42 percent of students walked or biked to school. Now that figure is less than 16 percent. More than a quarter of morning traffic is school-related. Getting more children to safely walk and bike to school will benefit our children, our community, and our budget. That's the goal of VDOT's Safe Routes to School program. Several Fairfax County parent groups are trying to prepare SRTS applications and they need better support. Since the program began in Virginia, there's been over $13 million in non-matching funds available to Virginia schools to encourage kids to walk and bike and to build sidewalks, bike facilities, and other infrastructure to make their trips safer. So far, Fairfax has received only $10,000 of that $13 million. Meanwhile we're spending millions of dollars on kiss & ride facilities that require our highly-trained school administrators and teaching staff to spend time directing traffic every morning and afternoon. The impact of these kiss & ride facilities extends beyond school properties; the traffic adds to congestion, interferes with school bus service, and creates safety and environmental problems. Sometimes the most dangerous place to walk and bike is in front of a school. For those students whose parents use the kiss & ride facilities, we’re really paying twice for them to get to school: We pay for the kiss & ride facility and we pay for their empty seat on the school bus, or for kids living nearby, we pay for improving their walking routes. We also pay the unintended costs of congestion, air pollution, more impervious surfaces, and dangerous conditions around the school. Safe Routes to School funds are a way to start bringing those costs down and bringing some balance back to our community. We can start slowly at a few schools, but I think we need to start now, and we need your support to make it happen. Gina Arlotto of WABA/Greater Washington DC Area Region SRTS Partnership and a group of SRTS proponents, including reps from FABB, Trails for Youth, and Vienna, will give a presentation to the Board of Supervisors Transportation Committee on February 1. We'll be asking for their support as well. See the Safe Routes to School in Fairfax Facebook page. Update: We did ride to the hearing, from Reston to Luther Jackson Middle School on Gallows Rd. Had we wanted to use just trails, as Supervisor Herrity suggested, it wouldn't have been possible. About half of the trip was on the W&OD Trail, but in order to get to the trail and to ride from the trail to the school, we used on-road routes. Most of the on-road sections were fine and needed no special bike accommodations. The trail along Lee Hwy extends for a few feet and then disappears. There is no trail along Gallows Rd. Riding on those roads isn't pleasant; some sort of on-road bike facility is needed unless the county commits to a complete, well-maintained, properly designed off-road system we're always going to need some kind of on-road facility for most people to be able to get around by bike. The trip took about 45 minutes by bike. There is no coffee cup or Kindle to get Burton Griffith thorough his 45-minute commute from North Reston to Tyson's Corner five days a week. That is because Griffith, a 32-year-old government contractor, gets there by bicycle. Hot day, cold day, he almost always rides. He rode to work after last winter's huge snowstorms, using special ice tires to get there. He rode to work this week, when it was single digits outside. Griffith says he made a conscious choice about transportation when he moved to the area from San Francisco three years ago. He and his wife have one car. "It is a lifestyle choice," he says. "So if I wake up, and it is really cold, there is no really easy other option of getting to work." Grifith says he commutes by bike for several reasons - he gets exercise while commuting, and being outdoors helps him clear his head before and after a day at the office. And there is less frustration on two wheels than dealing with traffic and angry drivers on four. "We have the ability to make choices," he said. "This is a choice you can make if you are not happy with your commute." What you don't see in the photo above, of my wife Kerie and I, are my front panniers. I usually have them on the rear but when it's set up for using my trailer, I switch the bags to the front. Update: We've corrected the link to the article above. Previously it pointed to just the photo, not the article. Fairfax police recently tallied the number of bike crashes in the county in 2010. There was a total of 86 reported crashes, and three deaths. We counted four deaths so we've contacted police about the total number being cited. There are many more crashes than those that are reported. A reported crash usually involves injury or major property damage. We often hear of cyclists who are hit by motorists and don't report the crash for various reasons. There is very little detail in the press release. We've received the data and will publish more details soon, including a map of crash locations that is being developed. Update: Now that we've read the press release again we see that the map of crash locations is linked in the last sentence. We've asked that if there is more than on crash at a location, that the symbol be changed. Not sure that is the case with this map as we haven't counted all the dots to see if they total 86. On an earlier map there were fewer dots than crashes indicating that some locations had more than one crash. Update Jan 26: Fairfax Police have corrected their website to indicate that there were four cyclists killed last year in crashes. Apparently the Washington region has bad traffic congestion. That's a bummer. I say "apparently" because I virtually never experience any of it first hand, since I've opted out of the lifestyle that requires people to sit in traffic. I live in the city, where it's easier and faster to get around by walking, transit, cycling and the occasional taxicab than by driving, so traffic congestion is simply not something I ever have to think about. I can remember exactly one traffic jam that I've been a part of over the past year, and it happened while visiting family one weekend in western Fairfax County. In my normal day-to-day routine, I haven't been in a traffic jam in years. Traffic jams are a choice. People choose to subject themselves to them based on where they choose to live and how they choose to get around. For me, opting out was an easy decision. Most of the bike people I know are what I would call book people as well, people who read books and probably like to browse bookstores. That's a gross generalization but I'll make it anyway, especially in light of a recent NPR story about bookstore owners who recently visited Revolution Cycles in Arlington. Bicycles and books: One exercises the body, the other the mind. Despite those obvious differences, a group of booksellers meeting this week in Washington, D.C., visited a local bike shop. The point of the trip: to find out what they had in common. NPR's Lynn Neary joined the tour. Mr. MIKE HAMMANWRIGHT (President and Chief Executive Officer, Revolution Cycles): To most consumers, our product is a passion product. Well, I think that's true of books, as well. I think people who love to read, they have a passion for books. 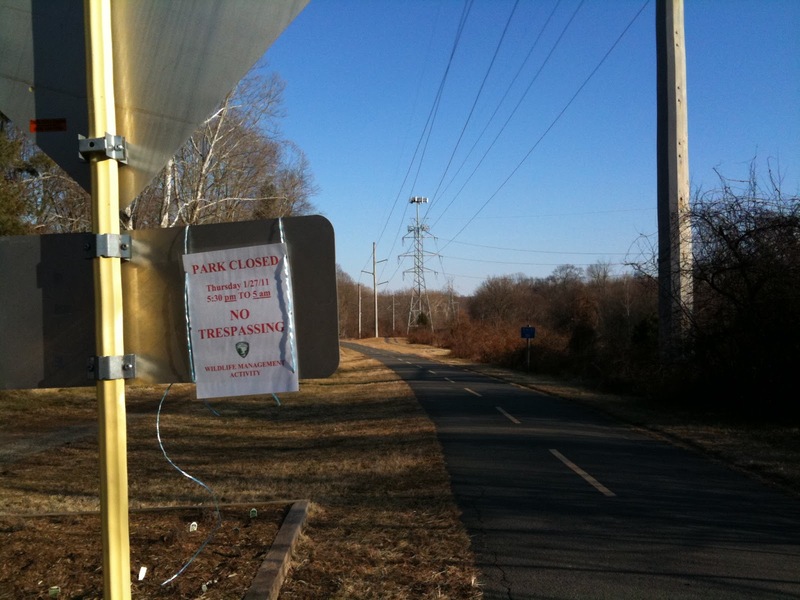 On Thursday, January 27 the W&OD Trail will be closed from 5pm to 5am on the 28th. Fairfax County will be doing "wildlife management," i.e. shooting deer, along the Trail between Vienna and Hunter Mill Rd. This is the second such "deer culling" operation; the first was on Dec. 2. 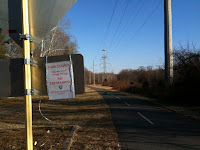 The sign on the right is posted just east of Hunter Mill Rd. There's also an electronic sign on Hunter Mill Rd just before the trail saying "Caution: Deer Crossing." Maybe the sign will finally get motorists to stop for trail users too. Actually we've noticed that motorists are getting much better at stopping for trail users at this location. As long as you're careful, you can usually get through the intersection within a few seconds vs. having a traffic signal where you're forced to push a button and wait for the signal to change. Personally we think it works better for everyone without a light. FABB attended the Vienna Bicycle Advisory Committee meeting last night to give an overview of our work and to discuss the Guide for Reviewing Public Road Design and Bicycling Accommodations for Virginia Bicycling Advocates. The committee meets on the 3rd Thursday of each month at 8:00pm in the Town Hall Conference Room. The public is welcome to attend. Courthouse Rd bike route: After the FABB presentation the committee discussed the proposed Courthouse Rd bike route project. The original plan was for bike lanes between Locust and Nutley Streets. Because there is parking on the road, and the Town won't use 10 foot travel lanes, there isn't enough room for the bike lanes. The latest plan is for an 11 foot travel lane with a white outer edge stripe, creating a paved shoulder. There will also be bike route signs with some wayfinding signs, although Shared Lane Markings will not be used. The plan works fine until a cyclist, riding in the paved shoulder, encounters parked cars and must navigate back into the travel lane. We think a 10 foot travel lane would work fine; it may reduce travel speeds, and if large vehicles need access, the original pavement is in place and for them the road should function the same. The Town Council will likely hold a public hearing some time in March. Safe Routes to School: The committee also discussed a Safe Routes to School grant application for Vienna Elementary School. The travel plan is complete and parents are in the final stages of completing the application. Now that a new SRTS coordinator has been hired, the grant process should begin again soon. brought up a problem of bicyclists creating unsafe conditions on the W&OD Trail when they speed by walkers and other users of the Trail causing near and sometimes actual collisions. 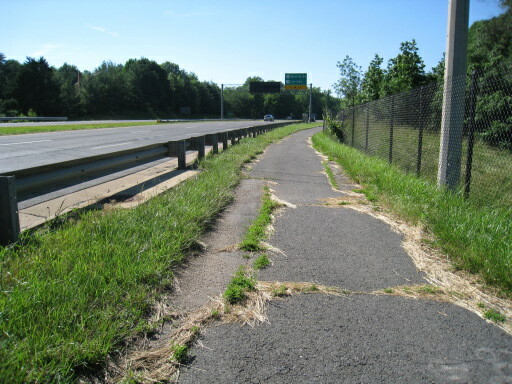 Since the W&OD Trail is not a "bike trail" but rather a trail for use by walkers, joggers and others not using two wheel transportation it requires that action be taken to protect the safety and rights of all persons on the trail. Councilwoman Cole though [sic] perhaps the BACK [sic] might look into a program of education for bicyclists so that the Trail can be used by all people and not, in my opinion, by a select few. This suggestions [sic] goes along the lines of my previous comments to you about bicyclists ignoring traffic control signs and signals creating dangerous conditions throughout Vienna. It is my understanding of that law that when bicyclists are on the public streets they must obey all posted traffic control signs and signals, something that is NOT happening. Please review this matter and perhaps the TSC can request the BAC to come up with some ideas on how to solve these problems. The committee is preparing suggestions. There is a problem with the W&OD Trail; too many people are vying for too little space. There is unsafe behavior on the part of many trail users, not just cyclists. One solution is to make our roads safer for cyclists. Fairfax has very few on-road bicycle facilities. To travel in the county cyclists are often forced onto major roads and without space for bicyclists, conditions can be dangerous. We're fortunate to have the W&OD Trail, but we need more options. The Town and county should also do a better job of supporting bicycle education. There are almost no bicycle skills classes for adults, and the elementary school bicycle curriculum is not being taught. Hopefully the advisory committee recommendations will include some of these suggestions. It's surprising how few companies have implemented the Bicycle Commuter benefit. The program has been in existence for over two years and we've only heard of a handful of companies where employees can receive the $20 monthly benefit for bike commuting-related expenses. GMU recently announced that they have implemented the benefit for all Mason full-time faculty and staff. To qualify a cyclist "must bike to any Mason Campus a minimum of eight times per month to be eligible for the benefit." Qualified employees will receive a "$20 voucher each month good at area bike shops." Most area shops honor the voucher. They also have access to shower facilities. GMU is also planning to hold bicycle education classes in the coming year. Congratulations to GMU for implementing the benefit and encouraging more employees to commute by bike. Promoting 'Bike-Friendly' Initiatives: Local bicycling advocacy group drives plans to make county more "bike-friendly." is the title of an article in the Connection newspaper by Victoria Ross about FABB. Fionnuala Quinn of Fairfax regularly hops on her Trek hybrid bike for many local trips, including visits to the dentist, grocery store and book club meetings. A native of Dublin, Quinn grew up bicycling and using public transportation. Bruce Wright and his wife, Kerie Hitt of Reston, also use their bikes instead of a car for many trips. For nearly 20 years, they bike-commuted to work on a daily basis. As active members of Fairfax Advocates for Better Bicycling (FABB), all three hope to make it easier for the other 200,000 bicycle-owners in Fairfax County to get out of their cars and onto the seats of their two-wheelers in the coming year. 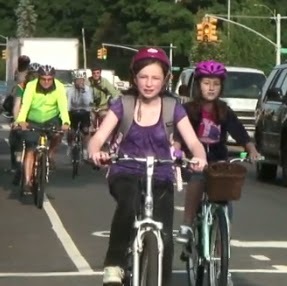 "We often hear 'I wish I could ride my bike to work or to school but it's just not safe enough around here,'" said Wright, chairman and co-founder of FABB, which has a core membership of about 30 residents and an email list of 850 area cyclists. "Since 2006, Fairfax County has become more bike friendly with the adoption of the county-wide bicycle initiative, but cyclists still need better-connected bike routes, secure bicycle parking and education programs to help them travel comfortably and safely," Wright said. Supervisors Hudgins, Foust, and Gross are quoted supporting our work. Supervisor Herrity doesn't think cyclists belong on the road; he thinks our trails are sufficient. He must not have ridden on the John F. (Jack) Herrity Parkway trail lately (also known as the Fairfax Co Parkway). It disappears in several locations with no signs indicating the detour, and in some sections there are wide cracks with protruding grass. The photo on the right was taken in 2008 just south of where the trail disappears at Lee Hwy/Rt 236. We complained to Supervisor Herrity's office about the trail in August of last year and received no response, and to our knowledge, the trail still looks like this. We're currently trying to get a wide crack in the trail near the Dulles Toll Rd fixed. A friend recently hit a protruding utillity cover on the trail, crashed, and was injured, luckily not seriously. Yes, we need a connected trail system and we need it maintained. We also need a connected on-road bicycle network; the two go hand in hand. Fortunately we have a bike coordinator who is developing a bicycle master plan for the county so we may get both in the future. Update: It looks like you must be logged in to Facebook (and be a friend of Jeff Anderson?) to see the photo and comments. 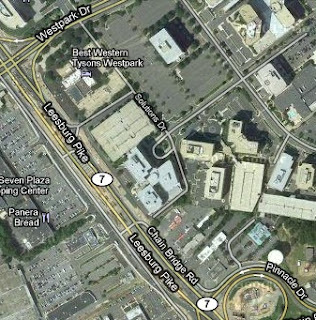 I regret to inform you that NCVC has decided to cancel the 2011 Tysons Corner Circuit Race, originally scheduled for April 3. Despite extensive work in November and December by former NCVC president and newest life-member Myron Lehtman, we were unable to secure access to the parking areas that we have used since 2004 or to meet with the current or potential new owners of the commercial properties that surround the course. Maintaining good relations with the affected property owners is key to ensuring that an event can return year after year. We explored another possible venue, but we have been unable to secure a firm commitment to an open date on the April MABRA calendar. Not enough time remains between now and early April to ensure a quality event. That makes them mad according to the Post's article Washington area tied with Chicago for traffic congestion, study finds. The article is based on a new study documenting how much time commuters spend stuck in traffic. The road lobby thinks the solution is more and wider roads. According to the Coalition for Smarter Growth, the study does not mention the impact of sprawl on commuting times. If we build more roads, we'll have more sprawl and guess what, we'll spend more time stuck in traffic. Isn't the definition of insanity doing the same thing over and over again and expecting a different result? Over the history of the mobility report, many commuters have moved farther from where they want to get to each day. "That increase in distance was enough to explain the increase in travel time," said Joseph Cortright, the study's author. A reexamination of the traffic data in that light shows that commuters' experience nationwide has not been universally bleak, he said. "In some cities, we've seen total travel times at peak hours actually decrease, because people are now driving shorter distances." He pointed to Portland, Ore., as one example. Even the D.C. region dropped from second to 12th place on peak travel time in this reworking of the data from the previous mobility report. As with the mobility reports, the data Cortright used do not quantify how miserable you are on Interstate 66 at the Capital Beltway in the morning or on the inner loop through Bethesda in the afternoon. But they suggest something individuals can consider: The effect on their travel lives of being closer to work and in a community that offers options that include transit riding and walking. For policymakers, Cortright suggests, the study asks whether their goal should be to increase road capacity for the sake of increasing peak-period speeds, or instead to concentrate on land-use plans that don't segregate home, office, commerce and entertainment into widely separated zones reachable only by cars. VDOT hires new Safe Routes to School Coordinator—The Virginia Department of Transportation is pleased to announce that Robert Williams has been hired to serve as our new Safe Routes to School Coordinator. Rob spent his teenage years growing up in Gloucester, Virginia. He returns home to Virginia from the Alan M. Voorhees Transportation Center at Rutgers University, where he assisted in managing Bike/Ped and Safe Routes to School contracts with the New Jersey Department of Transportation. As a part of those efforts, Rob performed research aimed at promoting safety and accessibility for biking and walking, took part in a successful effort to strengthen and clarify state pedestrian laws and trained law enforcement officials on motorist crosswalk enforcement. He also managed the statewide bicycle and pedestrian advisory group, trained municipalities to conduct walkability audits and contributed to a quarterly ped/bike newsletter. Rob holds a Master of Urban Planning degree from New York University and a BA in Public and Urban Affairs from Virginia Tech. Met this morning at 7, with a contingent from Charlottesville present to support HB 1683 (3′ passing of bicycles & do not follow more closely than is reasonable and prudent) being carried by Del. Toscano. Since the bill was heard relatively late on the agenda, Chairman Carrico determined that the witnesses would be heard, but that the vote on the bill would not be taken until next week’s meeting of the Sub-Committee, presumably since HB 2194, the identical bill being carried by Del. Ebbin, will be heard at that time, also. Testimony seemed to be well received by the sub committee, but we will have to wait a week to see how the vote goes and whether the bill will be reported to the full House Transportation Committee. Grants help kids do good works is an article in today's Kid's Post about encouraging kids walking and biking to school. It doesn't happen automatically. Many fewer kids walk or bike to school than 20 or 30 years ago with a subsequent increase in childhood obesity during that same time. We've also got more and more parents driving kids to school, kids that either have a seat on the bus or are within easy walking distance. The Post article discuss a $5,000 grant obtained by Maury Elementary in Northeast Washington as part of the Walk to School Challenge sponsored by Green Works and the National Center for Safe Routes to School. This year, the 288-student school has designated nearby Lincoln Park as a gathering spot on Wednesday mornings, and everyone who goes there then walks to school together. "On nice days it's almost the whole community," said the school's principal, Carolyne Albert-Garvey, who is well known for putting on sneakers and going for a walk at the end of her work day. "Me and my brother rode our bikes to school" on Wednesday mornings, said Jamari Young, 7, a second-grader at Maury who especially liked riding on the bumpy sidewalks. The challenge may be over, but Jamari is looking forward to warmer weather to "start back up." The more cyclists that come to the hearing to stand in support of the bill and, if inclined, offer their testimony, the greater our chances of positively influencing their deliberation. Bring your helmet for strong visual identification. Be mindful, there's no clapping or noise allowed from the audience. This bill is an effort to help educate Motor Vehicle drivers to pass bicyclists with a wider margin of error and thereby reduce the number of fatalities and serious injuries to cyclists. Current code says Pass by Two Feet, but it doesn't seem to be enough. 11 cyclists were fatally struck by Motor Vehicles in 2009 in Virginia, most of whom were hit from behind. Several were high profile cases: Daniel Hersh in VA Beach, Kevin Flock in Dinwiddie county, Dr. Joe Miranda from Lynchburg, all of whom were hit from behind. 11 were also fatally struck in 2010, but we do not yet have the details on their accidents. Drivers involved in such cases often state that the cyclist swerved into them as they were passing the cyclist. Vehicles pulling boats, horse trailers, and trailers with lawn care equipment tend to have extended mirrors on the passenger side which extend further than the driver realizes. Neither drivers, cyclists, or law enforcement carry measuring devices to know exactly how closely one vehicle is passing another, but 3 feet seems to be a recognizable educational tool to give the drivers the message to give the cyclists a wider berth. and the League of American Bicyclists has adopted this standard as one of the criteria for designating a state or city as “Bicycling Friendly”, which VDOT has unsuccessfully applied for in recent years. Passage of this bill will help the state's application for this designation, which will help attract more cycling tourists, and the City of Virginia Beach has requested that this bill be passed in their 2011 Requested Code of Virginia Changes. While two feet also leaves little room for error between two motor vehicles, motor vehicle drivers tend to give other motor vehicles a wider berth, particularly at higher speeds, and low speed maneuvering, such as in parking lots, often has vehicles as close as two feet. The driver and passengers in the motor vehicle are protected by the body of the vehicle, so passing by 24 inches seems to work well for motor vehicles. On the other hand, the bicyclist has no protection, resulting in small miscalculations or errors having catastrophic consequences for the bicyclist. The wind blast from a truck passing a cyclist by two feet at high speed is far more problematic for a cyclist than it would be for a motor vehicle. The catastrophic results of a collision suggests that a greater passing distance be required when a motor vehicle passes a bicyclist. It's unnecessary. How many cyclists have been killed or injured while being passed by 24"? None, but 36" sends the message to give the cyclist a wider berth, more elbow room, in case the motorist misjudges, or the cyclist wobbles. A number of cyclists who have been hit while being passed have been hit by the rear view mirror on the passenger side of the vehicle, particularly the extended mirrors often hung on the passenger side of pickup trucks when pulling trailers or boats. It's unenforceable. How can law enforcement, or the motorist, tell how many inches they are passing the cyclist by? They can't, but again, 36" sends the message to the driver to give the cyclist a little wider berth when passing them. Most motorists are very good about this, but some persist in cutting it too close. Many roads are not wide enough for the motorist to pass the cyclist without crossing the double yellow line in order to do so. I drive on a street every day where motorists cross the double yellow line in order to pass pedestrians walking on the edge of the pavement (there are no shoulders or sidewalks), cyclists, the mail vehicle making deliveries to the mail boxes, and trash trucks picking up trash or recycling---- All if the coast is clear. If some one is approaching, they do not pass, until the coast is clear. A lot of discussion last year that this is an educational problem, and DMV was asked to see if they could help. We met with DMV, who were very cordial, and we learned that the motorist taking the driver's exam will have one question out of 20 (rarely a 2nd one, since the questions are selected randomly from a pool of about 200 questions) pertaining to bicycles on the road. In addition there is a small mention of bicycles on the road in the Driver's Manual publication. Neither of these make a significant educational impact on the motorist, in my opinion, and the 36" passing law would be another item to drive home the message to give the cyclist a wider berth when passing them so as to pass them safely before pulling in. The Virginia Bicycling Federation has put together a legislative platform indicating their position on bicycle-related legislation: "With the 2011 Session of the Virginia General Assembly in high gear, the VBF met with cyclists across the state to discuss legislation effecting cyclists and pedestrians. Several representatives from bicycle advocacy groups met with U.S. Transportation Secretary LaHood to discuss a new report that shows that "pedestrian and bicycle projects created nearly twice as many jobs per dollar spent than typical road projects." In this case-study, "Estimating the Employment Impacts of Pedestrian, Bicycle, and Road Infrastructure," the Political Economy Research Institute compiled data provided by the city of Baltimore. They found that on-street bike lanes and pedestrian measures created more direct jobs, more indirect jobs, and more induced jobs per dollar than either road upgrades or road resurfacing. That report was followed last week by a survey released by the Centers for Disease Control and Prevention indicating widespread public support--67 percent--in America's cities for street design activities that increase physical activity. Bicycle and pedestrian activists have been very successful at achieving valuable safety gains for their stakeholders. Now is the time for advocates of cycling and walking to get into gear once again. Armed with the powerful arguments of energy conservation, environmental and health benefits, public demand, and--now--job creation and economic development, I am confident they will succeed. Rode from Sunrise Valley Dr into Herndon on the W&OD Trail today and there were just a few small patches of slushy snow left, and even then it was no problem riding through them. The trail is mostly dry and snow-free. It's also mostly free of people. We saw just a few cyclists and runners. We rode through Trailside Park at the W&OD Trail and Crestview Dr and saw several young lads on bmx bikes doing some impressive tricks. 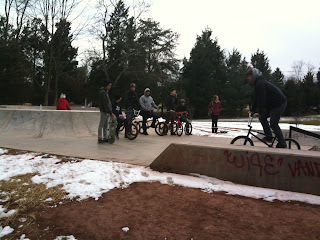 It was great to see some young folks having fun on bikes. Virginia Governor McDonnell recently announced 900 statewide projects to be funded by selling more booze, borrowing money, and taking $140 million from the general fund. Fairfax County projects include several that contain bike facilities: I-495 HOT Lanes Bicycle/Pedestrian Facilities (probably trail connections, $100,000), Mulligan Rd widening from Route 1 to Telegraph Rd (wide outside lanes; it will become part of U.S. Bike Route 1 once completed, $584,625). Other projects that include some bike facilities include Rt 50 widening from Rt. 28 to Poland Rd (sidepath, $40,658,585), Fairfax Cty Pkwy Extension Project (sidepaths in three segments, $3,304,166, $742,862, $464,069), West Ox Rd widening from Penderbrook to Ox Trail (sidepath, $586,607, although we thought this project was completed), Telegraph Rd widening from Beulah St to Leaf Rd (bike lanes and sidepath, $13,245). Cyclists will need to ensure that other projects include bike facilities. What's key with all of the listed projects is ensuring that VA complies with the "Policy for Integrating Bicycle and Pedestrian Accommodations." This is especially true of bridge replacements which occur much less frequently than road widening. See the Governor's press release. "About two out of three adults are willing to take civic action to support local street-scale urban design policy changes that make walking and biking easier in their neighborhoods, according to a new CDC study published in the January 2011 issue of the Journal of Physical Activity and Health. Street-scale design changes were recommended by the Task Force on Community and Preventive Services based on studies that showed physical activity increased by an average of 35% following such changes in neighborhoods. We were pleased to see that Chairman Bulova mentioned the need for developing a multi-modal transportation system in her State of the County Speech today: "Transportation is not just about roads." As I discussed earlier, improving mobility in Fairfax County that incorporates multi-modal options for our workers and residents will be a top priority for 2011. Transportation is not just about roads. We must also plan for and invest in pedestrian and bike routes, light rail, Metro, the VRE and transit. And most importantly, these various modes need to be developed in a way that they connect and create an efficient system for those of us who live, work and play in Fairfax County. During the months ahead, I will work with my colleagues, our staff and with the Commonwealth and our Federal partners to flesh out our multi-modal transportation plans. History is being made as what has been a sprawling (albeit highly successful) retail and commercial center, amid a sea of impervious parking lots, is being transformed into a compact, walkable, transit-oriented, mixed use urban community – a new development pattern for Fairfax County, offering a new lifestyle choice for our residents. That should include the multi-modal transportation goal and one way to show support is to establish a Safe Routes to School program. The Alexandria Transportation Commission is discussing whether the City Council should adopt a Complete Streets ordinance. Staff have suggested that the City adopt a policy instead of an ordinance. As Jonathan Krall, an Alexandria bike advocate, stated in a BikeWashington post, "The distinction is that a policy can be ignored. Virginia has a 'policy,' not that you'd notice." (I'm a member of the BikeWashington group, so I'm not sure if the post is accessible by everyone.) Staff argue that complying with an ordinance would add to the time and cost of reviewing projects. It would also require updating of their 25-year-old street design manual. Sounds like that would be a good thing. See summaries of the discussion by Krall, Alexandria Complete Streets followup and a blog entry by Froggie, Complete Streets: What's the Right Policy? You can also read the Alexandria documents under discussion: the Draft Complete Streets Resolution, a comparison of Complete Streets policies in other jurisdictions (Virginia's policy isn't one of them), and a Complete Streets policy checklist. There's been discussion about whether Fairfax should have a Complete Streets policy. With such limited control of our roads it almost seems like a moot point. However, the county does manage some road projects and the policy or ordinance could apply to those projects. It could also form the basis of comments on all road projects, whether being managed by VDOT, private developers, or the county. In her blog Lane Change, Kate Ryan, a reporter for WTOP, mentions the BikeMaryland legislative agenda. Well the title really says it all, "Potential 2011 Legislative Priorities (policy changes pursued when possible)." It's a good summary of what bicycle-related legislative or policy changes are needed in Maryland. I don't think we have the same in Virginia. There are two statewide groups that could take this on, BikeWalk Virginia and Virginia Bicycling Federation. BikeWalk has full time staff and likely has the resources to put it together. They used to hold an annual or bi-annual statewide bike/ped meeting but it's been a while since the last meeting and I don't see anything about one on their website. VBF does great work in Richmond once the short VA legislative session begins, but they don't have a similar, publicized legislative agenda before the session. They also don't have paid staff or the resources to hold a statewide bike meeting. Maybe the two groups can get together, bring together cyclists from around the state, and hold a statewide bicycle summit, not just for professionals, but for everyone; advocates, professionals, recreational clubs, etc. Developing a wish list of projects and legislative goals could be part of the summit. Maybe this is something to work towards in the coming year. Several bills have been filed in Richmond that affect cyclists: Requiring motorists to allow three feet when passing a bicyclist, allowing bicyclists to pass through a red light after a specified period of time, and creating a new infraction, reckless operation of a bicycle, with lower penalties than the current reckless driving law. As we learn more about these bills we will publish it here. During the legislative session, which begins today, Virginia Bicycling Federation tracks bike-related bills on their site. HOUSE BILL NO. 1683 (SB1683)—A BILL to amend and reenact §§ 46.2-816, 46.2-838, and 46.2-839 of the Code of Virginia, relating to following too close and passing other vehicles. Patron: Delegate David Toscano (D-Charlottesville). The driver of a motor vehicle shall not follow another motor vehicle, trailer, or semitrailer more closely than is reasonable and prudent, having due regard to the speed of both vehicles and the traffic on, and conditions of, the highway at the time. The driver of any motor vehicle overtaking another vehicle proceeding in the same direction shall pass at least two feet to the left of the overtaken vehicle and shall not again drive to the right side of the highway until safely clear of such overtaken vehicle, except as otherwise provided in this article. Any driver of any vehicle overtaking a bicycle, electric personal assistive mobility device, electric power-assisted bicycle, moped, animal, or animal-drawn vehicle proceeding in the same direction shall pass at a reasonable speed at least two three feet to the left of the overtaken bicycle, electric personal assistive mobility device, electric power-assisted bicycle, moped, animal, or animal-drawn vehicle and shall not again proceed to the right side of the highway until safely clear of such overtaken bicycle, electric personal assistive mobility device, electric power-assisted bicycle, moped, animal, or animal-drawn vehicle. The Senate version of this bill is SENATE BILL NO. 928 (SB928). It contains identical wording as HB1683. Patron: Senator McDougle (R-Hanover). B. Notwithstanding any other provision of law, if a driver of a motorcycle or moped or a bicycle rider approaches an intersection that is controlled by a traffic light, the driver or rider may proceed through the intersection on a steady red light only if the driver or rider (i) comes to a full and complete stop at the intersection for two complete cycles of the traffic light, (ii) exercises due care as provided by law, (iii) otherwise treats the traffic control device as a stop sign, and (iv) determines that it is safe to proceed. B. Notwithstanding any other provision of law, if a driver of a motorcycle or moped or a bicycle rider approaches an intersection that is controlled by a traffic light, the driver or rider may proceed through the intersection on a steady red light only if the driver or rider (i) comes to a full and complete stop at the intersection for 120 seconds, (ii) exercises due care as provided by law, (iii) otherwise treats the traffic control devices as a stop sign, and (iv) determines that it is safe to proceed. We were deeply saddened to hear about the sudden death of Jack Corkey, owner of Great Harvest Bread Co located in Herndon and Vienna. 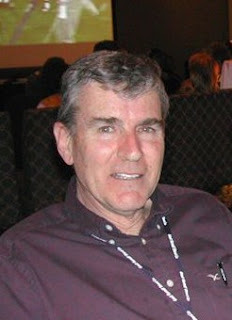 Jack was a great friend of bicyclists in this area. Both shops are located adjacent to the W&OD Trail and their shop was a favorite stop for many cyclists. There is nothing better than a free slice of Great Harvest bread after a long ride. Several years ago Jack tried to take advantage of the shop's proximity to the W&OD Trail by having bread delivered to the Vienna store using an electric-assist tricycle. Pat Kraker, who at one time worked at bikes@vienna, developed the trike and did the deliveries for several years. You may remember seeing the trike on the trail; it had a sign displaying how many gallons of gas were saved using the trike. Jack supported the Reston Bike to Work Day event from the very first year in 2002. He donated bread rolls every year and they were one reason many cyclists attended the event. Jack sold the store in 2009 and Tim, the new owner, has continued to support Bike to Work Day. Jack was a great guy and will be greatly missed by the many people whose lives he touched. There will be a a Remembrance Book at the Herndon location that will be presented to his wife Laurie, so if you want to share a fond memory of Jack, stop by and sign the book and if it's on Wed. the 12th have a slice of Jack's favorite bread, Country Whole Wheat. The Virginia state bicycle coordinator position has been vacant for a year and VDOT is still trying to fill the position. The latest bike coordinator job announcement closes on January 18. The salary range is $40,959 - $65,000. In a time of high unemployment there seems to be little reason for this position to go unfilled. While the salary range seems low, there must be many young bicycle professionals looking for work. There would certainly be many challenges; perhaps too many. Why is this job going unfilled? Or as the Post headline reads, Urbanizing Fairfax considers expansion of parking limits. As Fairfax becomes a more urban place, residents will rely less on cars and more on public transportation, walking, and of course biking. As a result, we need to update requirements for parking in the more urban areas of the county. Working to ease traffic jams in the steadily urbanizing suburb, the county's Transportation Department is drafting proposed rules that would limit parking in new developments near Metro lines. Such parking limits have already been adopted by the Board of Supervisors as part of the plan governing Tysons Corner's transformation into an urban hub. But imposing maximums in other parts of Fairfax where transit-oriented development exists would represent a significant departure in a suburb where generations of planners drew up plans around the automobile. "We often like to say that too much parking can be a traffic magnet," said Stewart Schwartz, executive director of the Coalition for Smarter Growth. "If we're going to address traffic and make a walkable community in Fairfax, it's important to get the parking right." "You're really talking about not allowing developers to build parking spaces? How can you limit the number of cars somebody owns?" Cook said. He and other skeptics wonder what would happen to people who purchased a townhouse with limited parking but then switched jobs or encountered some other circumstance affecting their ability to commute to work by Metro. "They can't take the Metro if it goes the wrong way," Cook said. true costs of free parking are rolled into the cost of a house or office building. If anything, Shoup said, Fairfax has promoted cars for too long. "If you look at it from the air, it looks like a parking lot," Shoup said. An analysis by real estate consulting firm Robert Charles Lesser & Co. found that, compared with the rest of the Washington metropolitan area, Fairfax attracted a smaller percentage of the fastest-growing segment of householders - those with one or two people per dwelling - in the past decade. Many of them prefer walkable communities, Schwartz said. "The millennials, in particular, are sort of the Zipcar generation," Schwartz said. Fairfax County does not control most roads in the county. They are the responsibility of VDOT. 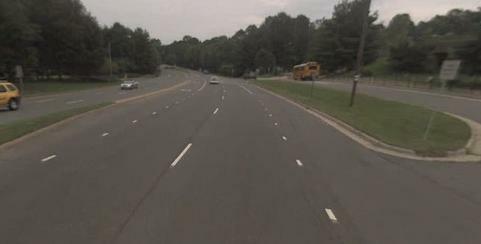 Fairfax County has undertaken a study to determine the implications of taking over some or all maintenance and construction of public roads in the county exclusive of Interstate highways. A draft of the study is available on the county website: Alternatives for Improving Roadway Services in Fairfax County. Anonymous User: What are the real odds that the county will take over roads from the state? Sharon Bulova: Essentially, all roads in Fairfax County are maintained by the state. The prospect of taking over the maintenance and operation of the roads would be extraordinarily expensive. While we would like to improve on the maintenance and have more control over operation, we need to be very careful about the cost implications of doing so for our taxpayers. County staff presented an initial analysis of the proposal, and we have asked for a more in depth look at the options we discussed. The General Assembly has not provided sufficient funding to maintain the roads at a level that our constituents expect. Taking over the roads at this point would be equivalent [to] the car being run out gas, failing its safety inspections, and being rolled into the driveway for us to take over. AC Chen: I live less than two miles from Tysons Corner in Vienna. There are no safe ways to either walk there or ride my bike. Considering the large population that works and visits the commercial area surrounding Tysons, that seems to be a real shame. Sharon Bulova: County staff continues to engage with stakeholders (particularly people like you) to conduct the Tysons Metro Station Access Management Study (TMSAMS). 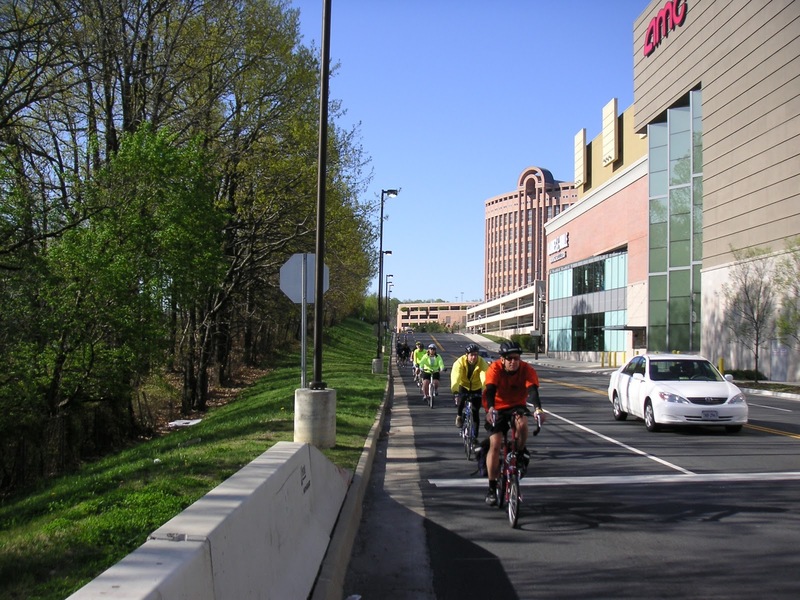 Once complete, the study will identify the most effective ways to connect the bike and pedestrian trails that are part of the redevelopment of Tysons Corner to the surrounding neighborhoods allowing people to safely get in and out of Tysons on foot or on their bike. We feel it's critical to the success of mixed-use developments that they be walkable and bikeable, which will relieve congestion and protect the environment. For more information on the County's Bicycle Master Plan, visit: http://www.fairfaxcounty.gov/fcdot/bike/county_bike_master_plan.htm The Bicycle Master Plan encompasses a 3-mile radius from the Tysons Metro stations. We've had some great riding weather lately. Even though many people have put away their bikes for the winter, this is one of the best times of year to ride. The trails are clear and free of traffic; during rides along the W&OD Trail yesterday we saw a handful of cyclists, a pleasant change from the summer crowds. The sun was out and it was a little cool, but with the proper layers we were easily able to regulate our temperature. For tips on riding in winter weather there are a couple of good Patch articles: Preparing For Winter Bike Rides by Tim Fricker, owner and head mechanic at bikes@vienna, and Put Away the Bike for the Winter? Not In Arlington by Mark Blacknell, chair of the Arlington Bicycle Advisory Committee. Why not get our and ride before the next snow falls? It's rare that there is a public discussion of bicycling without someone complaining about bicyclists' behavior. It doesn't happen when we discuss driving or walking but for some reason bad behavior by bicyclists seems to really annoy some people. With the frequent calls for cyclists to "start behaving," it's clear that a number of people driving and walking are unsettled by the conduct of at least some people on bikes. But people in cars speed all the time, and people walking cross against the light, and neither generates as many newspaper letters to the editor. What is the difference? One explanation is that people naturally notice infractions by others on different modes more than those on the same mode. People driving tend to see misbehavior by people walking and cycling rather than from other people driving, for example. Since relatively few people ride bicycles while a great many drive, the outraged letters would skew toward misbehavior by those on bikes and away from that by people in cars. The trouble all starts when you drop bicyclists into the mix. At that point, a whole new set of combinations comes into play, and as a city we haven't worked out how to make them work. In other cities, especially in places like Copenhagen or Utrecht, bicycles are ubiquitous and everybody knows how to behave on and around them. But we're not there yet. David goes on to propose various behaviors by bicyclists and whether they should be part of a "bicycle social contract." Rather than list them here, read the article and read the comments. For once there is a reasonable dialog about this issue and very little whining. Thanks to David for starting this discussion. There is a growing interest in providing kids with the option of safely walking and biking to school. It's part of a larger movement to make our communities more livable, less car dependent. In December the Board of Supervisors asked county staff to coordinate a Safe Routes to School (SRTS) grant application. Despite previous attempts by the Board to encourage Fairfax to get involved in this program, there is currently only one school, Lynbrook Elementary School, receiving SRTS funding, in a program managed by Trails for Youth. There is now a new Facebook page, Safe Routes to School in Fairfax. Check it out for the latest SRTS news in Fairfax. We're aware of SRTS efforts in Springfield (Lynbrook ES), Burke (Terra Centre ES), and Vienna (Wolftrap, Louise Archer, Marshall Road, and Vienna slementary schools). 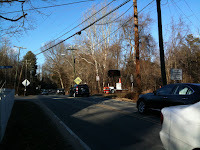 If you know of others, why not write on the Safe Routes to School in Fairfax Facebook wall to let us know about them. Virginia Bicycling Federation (VBF) announced today that Senator Ryan McDougle will sponsor a "three feet to pass" bill that would require motorists to allow three feet when passing cyclists. The bill was filed last year but did not pass. See previous VBF blog posts about last year's session. VBF does a great job of tracking legislation during the short Virginia session, and we'll pass on that info here as the Senate and House bills work their way through the system. We’ve had a busy twelve months! Over the last year, FABB has been a strong local voice for those who want to ride safely in their community, whether to their place of work, their child’s school, or the local farmer’s market. This was also the year when FABB celebrated five years of volunteer bicycle advocacy, and what follows is a summary of some of this year’s events and happenings. Planning for the future Fairfax: Fairfax County is working on a county-wide bicycle plan that will determine how bicycle-friendly design should be incorporated into future roadway and transit projects. Several FABB members are serving on the advisory committee for the Tysons phase of this project. Phase II, which includes the entire county, will begin once the Tysons phase is completed in February. New bike infrastructure in operation: Bike facilities were installed on Wakefield Chapel Road and Gallows Road while construction proceeded on the bridges across the HOT lanes. The installation of the Wolftrap Bridge demonstrated the value and importance of adding small missing links. Meanwhile, early results show a significant drop in vehicle crashes on Lawyers Road during the first year after the “road diet” which included adding bike lanes. FABB volunteers in the community: FABB representatives spoke out at many public meetings, appeared in media articles, and provided input to various committees. Thank you to the great volunteers who came out in all weather for bike light installations, bike rodeos, bike valets, and bike-to-work day events and more. New and old modes of communication: While continuing to post over 250 articles this year alone on the FABB blog, FABB made 300 friends on Facebook and gained 500 followers on Twitter, our first year of using these tools. Our postings reached a wide audience as many articles were discussed on regional and sometimes national sites. Meetings and visitors: We met on the third Wednesday of every month at Patrick Henry Library in Vienna. A number of special visitors joined us: Ian Edlin, Trail Voice; Tiffany Guinn and Christi Kruse, GMU Bike Village; Cindy Englehart, VDOT; Virginia Delegate Kaye Kory; Larry Marcus, Virginia Megaprojects; Frank Raiti, MidAtlantic Off Road Enthusiasts; Chris Eatough, BikeArlington; and Ken Thompson, Reston Bike Club. All are welcome at these meetings and we meet next on February 16, 2010. Awards, honors, gifts and grants: In July, we published the Advocate’s Guide, funded by a grant from the Alliance for Biking & Walking. We were subsequently recognized with an award from Fairfax County for this project. FABB was also recognized at the Future of Fairfax event organized by the Coalition for Smarter Growth. We received a generous grant from Transurban-Fluor to assist us with bike light giveaways and in conducting bike commuter seminars. We were grateful also for the gift of a canopy from REI. We appreciate all of the support and recognition. Rides and celebrations: Many riders county-wide participated in various rides: Bike to Work Day on a glorious day back in May, the Critical Manners Ride in Vienna on an incredibly hot July evening and the Tour de Tysons which included officials and consultants. Celebrations included the FABB Fifth Anniversary and the launch party for the new Guide. The monthly bike trains at Wolf Trap Elementary School, organized by parent Jeff Anderson, have been an inspiration to the community and we hope to see many more children riding through the Safe Routes to School program in 2011. Conferences, workshops and other bike events: FABB representatives attended the National Bike Summit in Washington DC, ProWalk ProBike in Tennessee, Car Free Day in Arlington, Bike to Mason Day at George Mason University, Celebrate Fairfax! bike valet, Cyclefest/Paul’s Ride for Life, Earth Day, Herndon Festival bike valet, James Madison HS Fall Kickoff Festival, ThinkBike DC, Future of Fairfax , and congressional visits on the Hill. Along the way, we learned lots, made many valuable connections, and met a wide range of folks working on bicycling issues. Controversy, dispute, and disappointment: Despite meeting with officials, an organized letter-writing campaign and public testimony, FABB did not succeed in discouraging the county from eliminating all operating funds for the county bike program. For now, the bike coordinator position was preserved. We continue to work to get support for bicycle planning in the county. At the state level it was a loss for all Virginia cyclists when the three-foot passing law, championed by the Virginia Bicycle Federation, failed to be adopted into law. Four bicycle fatalities in the county: A teen walking his bike was killed by an out-of-control vehicle, a nine-year was killed by a motorist as she crossed a busy local road, a seasoned bike commuter was killed as he rode through an intersection, and an elderly man was killed crossing a neighborhood street. We installed our first ghost bike to act as a memorial and to remind drivers to share the road. Our work for improved safety and driver awareness continues. 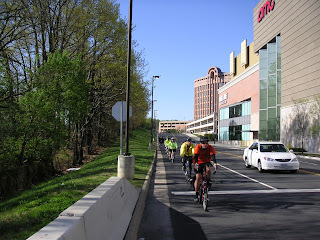 Bike forecast for 2011: We look forward to the completion of Phase I of the bicycle master plan (Greater Tysons area) and the start of Phase II, which includes the entire county. We are anxious to see appointments in some key positions: the Fairfax County Transportation Director, the State Bike Coordinator and Virginia Safe Routes to School Coordinator. We also hope to see the Safe Routes to School program launched widely within Fairfax County. We must be smart about our future planning of Fairfax and consider the safety and access needs of bicyclists. Thank you for supporting us in all our work in 2010 and we look forward to a busy 2011. February 7, Meeting to discuss pedestrian/bike safety along and across Burke Center Parkway – The meeting will be held on February 7 at Terra Centre Elementary School, 6000 Burke Centre Parkway Burke, VA 22015. Supervisor Cook will lead the meeting and representatives from VDOT, School Board, Fx Co DOT, and state representatives will be invited to attend. February 16, FABB monthly meeting - We are not holding a regular FABB monthly meeting in January. The FABB board will meet on January 9 to discuss our workplan for 2011. The next regular monthly meeting will be held on Wednesday, February 16, at 7:30 p.m. at Patrick Henry Library, 101 Maple Avenue East Vienna, VA near the W&OD Trail. Tysons Bicycle Master Plan public meeting - Early February. For more details on above events, see the FABB Events page. See also the WABA events page.